Lebanon’s Maronite Patriarch Beshara Rai’s visit to Syria this Sunday drew mixed reactions in Lebanon. While president Michel Suleiman praised it and urged against politicizing it , March 14 General Secretariat coordinator Fares Soueid rejected it on the basis that it could subject the Christians of Syria to danger. Rai will be in Syria on Sunday to attend a ceremony marking the appointment of the new patriarch of the Greek Orthodox Church. “Rai will be in Syria on Sunday to participate in the official appointment of Greek Orthodox Patriarch John X Yazigi just as he participated in the appointment of Coptic Pope Bishop Tawardos in Egypt,” Bishop Samir Mazloum told Al-Joumhouria newspaper. An Nahar newspaper reported that Rai’s visit would be the first for a Maronite patriarch since Lebanon’s independence in 1943, after the visit carried out by the late Patriarch Antoun Arida during the French mandate. President Michel Suleiman said Saturday Rai’s visit to Damascus should not be politicized, adding that he supported the patriarch’s trip. “The visit by Rai should not be placed in a political context,” Sleiman told reporters after attending a Mass for St. Maroun Day in Gemmayzeh, Beirut. “The patriarch is the head of the Maronite Church in Lebanon and the whole East and along with the president represents the guarantor for all Christians in the East,” he added. “Yes, I am for the visit,” he said. John X Yazigi, bishop of Western and Central Europe, was elected Greek Orthodox patriarch of the Levant and Antioch, succeeding Patriarch Hazim Ignatius IV who died in December 2012. The election took place during a gathering of 18 bishops from Greek Orthodox archbishoprics around the world who met in Lebanon to elect Hazim’s successor. Although the meeting with Assad has not been confirmed yet, it could raise controversy and complications even if it is listed as part of the protocol, An Nahar daily reported on Saturday. 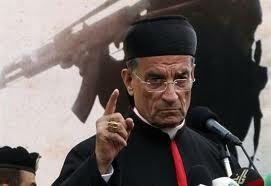 This is not the first time Rai gets himself in trouble with March 14 since he replaced Patriarch Nasrallah Boutros Sfeir . – Last November he defended Hezbollah suspects who were indicted in the assassination of former Prime Minister Rafik Hariri, by the UN-backed Special Tribunal for Lebanon (STL). “No party has the right to demand the handover of the accused because the accused is innocent until he is found guilty and the matter is entirely left to the judiciary,” He was quoted as saying last November 24th. – During his visit to Paris in September 2011 Rai also came under fire from March 14 parties but won praise from March 8 politicians for his comments. “Syrian President Bashar al-Assad is open-minded and should be given more chances to implement the reforms”. I wonder how the Protestants are doing …. hmmmm …. You know … ‘convert or die’. now his @$$ started itching? “No party has the right to demand the handover of the accused because the accused is innocent until he is found guilty and the matter is entirely left to the judiciary,” ……..
Well, aside from the fact it is ‘the law’ which demands that the ones being charged should show up in a court to answer charges … and their innocence will be assumed until proven otherwise … and defence council is being supplied if they don’t hire their own ……….. IF we assume they don’t want to be there to defend themselves, and then that they are found guilty by all evidence against them, are they then expected to show up and hand themselves over for their sentences after the fact? Does Rai expect that? Is this a Maronite ‘confessional’ tradition?